This bright and airy Private Home is located in The Sanctuary, an exclusive gated enclave set within the already gated grounds of the Key West Golf Club with its beautiful and challenging Rees Jones 18 hole course. 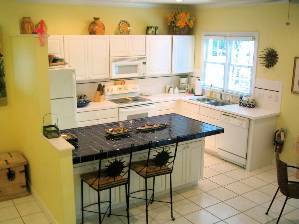 This Home was recently renovated and redecorated to a very high standard. The decor is bright and cheerful with an accent on the tropical. There is a plunge pool in the back yard and just a short walk away is the beautiful community pool, which has a waterfall and is larger than most hotel pools. There is a pull-out Queen-size convertible in the living room, a powder room and a separate shower for extra guests. There are overhead fans in every room in the house. 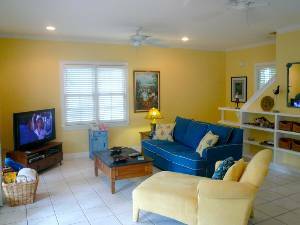 There are 3 TV's, a 42" plasma high definition TV in the living room and and two regualr sets in each of the bedrooms. Washer and dryer are on the 2nd floor. Expanded High Definition cable TV is included. 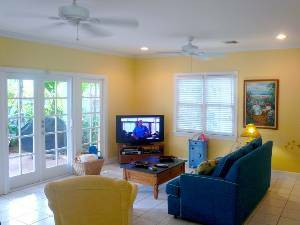 Digital cable with pay-per-view and high-speed Internet access are available upon request. 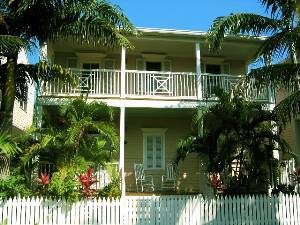 This property will accommodate up to 6 adults. 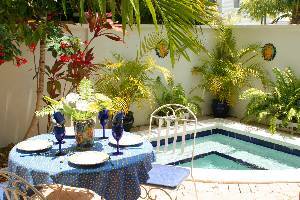 The back yard is surrounded by a 6 foor wall for privacy, and there is a jetted plunge pool. There's plenty of room for everyone. The couch pulls out to a queen bed and there's a full bathroom on the main floor. There are French doors to the back yard, and a high-def 42" plasma TV when you're tired of paradise. Spacious and completely equipped for the most demanding chef. The first master bedroom has a queen bed & french door to the upstairs porch. 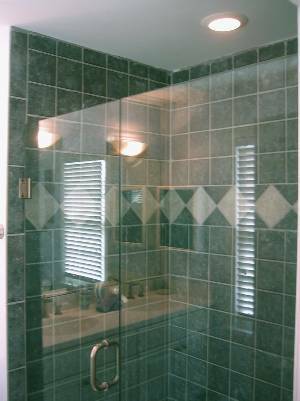 The first master bath has twin vanities and custom glass shower. The shower is double the normal size, big enough for two! tails....the only way to cook them is on the grill. I stayed in this rental for a 2 week trip. 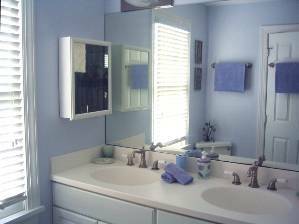 The unit was very clean upon arrival and the amenities were just as listed on the website. The kitchen was very nicely stocked with the necessary items to complete any meal that I made! I also enjoyed the private spa on the very private patio. I would recommend this home to future renters! 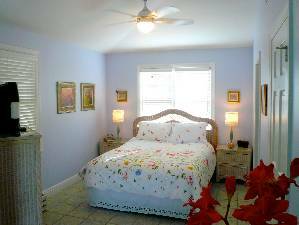 The Spa is a beautifully appointed home in the Key West Golf Club Community. It was absolutely clean on our arrival which is important to us. I only have the highest praise for the owner's and this gorgeous rental property. Shorter occupancies permitted. Rates do not include 12.5% tax or end-of-rental cleaning. Holidays and special events may be a higher rates than shown here.